Petunia and the Vipers are coming to Blackbird Hall! Blackbird Hall, 10768 King George Blvd. 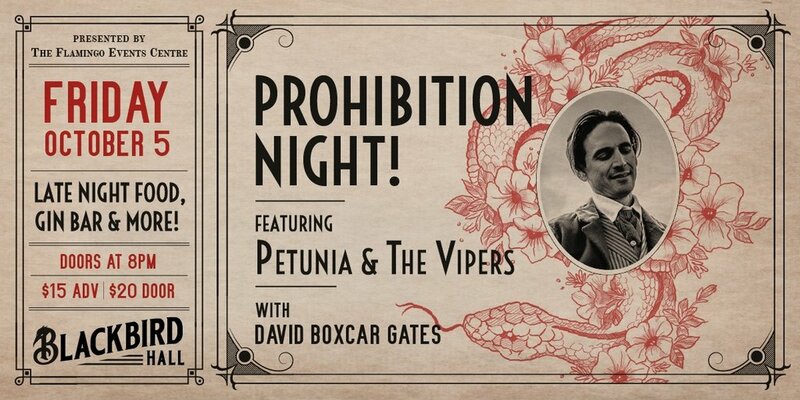 In celebration of Petunia and the Vipers and their unique style of music, we are having a special "Prohibition Night" evening at Blackbird Hall. This will be a night of dancing, speakeasy style gin bar, casino games and more! Louis Armstrong was once asked what his favorite kind of music was, and his response was simple; “Good music”. Petunia & the Vipers’ sound may not sit comfortably in one certain genre, but “Good Music” describes it well. Hank Williams on acid… Tom Waits meets Elvis at Woody Guthrie’s Hobo junction… Avant-Country night club scene music… One of the best bands in the world today, of any kind… hillbilly-flavoured-swing inflected-ragtime-goodtime-thunderously rolling-one-of-a-kind-you-don’t-want-to-miss-this-sort-of-a-show… A new music that springboards off of music of the past and jumps into the present day, left with only echoes of the past… Something in between 1920’s and steam punk. It’s good for your mind… These are just a few of the words uttered by folks around the globe trying to pin down a description of all that is Petunia & The Vipers. WHITE ROCK/SOUTH SURREY/OCEAN PARK : Preparty will be held at White Rock Beach Beer Company at 15181 Russel Avenue in White Rock. We will be facilitating car pooling and safe rides home for this event please contact us if you are interested!